From my teen years the prefix ‘mono’ left me craving for more. For me mono denies Abundance. Not that mono is good or bad per se, however, wether it be monogamy, monotheism, monopoly, monosyllabic, monologue or monolith, I have always had a propensity towards POLY. Whilst I adore the drama of the monochrome, I find Polychrome fantastic. While I respect a mono-theist’s singularity of belief, I believe in a universe of many Gods. All interconnected energies and faiths pass through my heart. I LOVE loving many. Pantheism feels aligned with my being. I drew from a very young age. As a primary school child, notebooks felt rather sacred as they were under scrutiny from teachers as well as my Maa who would help with homework. Text books on the other hand had spaces to be filled by scribbles. They were only for my eyes. One time, in my class Mr. Jaffery, the religious studies teacher, caught me in the act of drawing a woman in the book. On picking up the book, other pages revealed a scattering of men and women drawn where ever there were blank spaces. I had pretty much ravaged that book. He explained that books were not meant to be drawn on, and most importantly as muslims we weren’t allowed to draw the human form. “On the day of judgement, we would have to bring them to life”. I have often wondered if thats what he really said. However in my imagination thats what he meant, and it only added fuel to the fire, I drew only what I found beautiful. All along thinking, come the day of judgement, all those beautiful men and women would be mine! I was good at drawing, won awards several times and in the gap between finishing my secondary school and starting college, I asked to stand-in for the school drawing teacher. At college, the history tutor, rather moody, saw a portrait I’d painted of Rekha, his tune changed, not just with me but all my possie. A friend’s sister doing her bachelors of fine arts would often ask me to help paint the ears and hands. By the time I applied to study at NCA, the only dedicated arts institution in Pakistan at the time, I knew, despite the tough competition, I would be part of it. Most people suggested I take Graphic Design as there were better options for employment. While at the arts school, in as much as drawing was part of my dreamscape, photography was also my love and it became more important to me. There was no space for polyamory, it wasn’t encouraged. While working in advertising I found myself only engrossed in photography, and to the point I lectured in photography at my old arts school. Thirty years ago, I got a British Council Fellowship to do my masters in England. It was the universe or the Gods guiding me to my truth, the right tutors and people who encouraged mixing, who saw beyond the confines of boundaries. Every thing alternative was my play field; photography, live art, film, theatre or installation, you name it and I was doing it, except for drawing. I also started a ‘relationship’. The arts company motiroti my partner and I set up, fulfilled me creatively as the work we made defied genres and it kept me happy. ‘Mono’ had me tethered whilst my truth is ‘Poly’. A little later than a decade our paths diverged and I restarted my exploration of self. Under my sole direction, the folio at motiroti evolved, the experiences created for the audiences combined new technologies with very analogue and basic. Georg, Richard, Brian, Graeme, moi e Jonathan. This spring, events converged beautifully for me to reacquaint myself with my love. A friend presented a hand bound notebook from Vietnam, an other friend staying with me drew every morning. Everything around me was encouraging me. On 04/03/2018 I picked up a black conte, pulled up one of my photographic portraits for a reference and drew. My self-critic started revving up a tantrum, which I totally ignored and made another drawing and then another. Congratulating myself for overcoming the first of the hurdles, I published it on FB. Drew my dear friend Aliya’s portrait and then there was no stopping me. I kept drawing portraits, of my Maa, Paolo and Dylann, ‘romantically’ vowing to make a drawing each day. Even as I made that vow it was clear that is not how I wanted to progress. Three years ago, my friend Jonathan had mentioned Male Intensive Enquiry Unit (Male IEU), a collective that met at his studio for life drawing. Having seen one of my drawings on social media, he asked, “So what would it take to invite you to our weekly sessions of life-drawing?” “Invite me again?” was my quick and precise response. 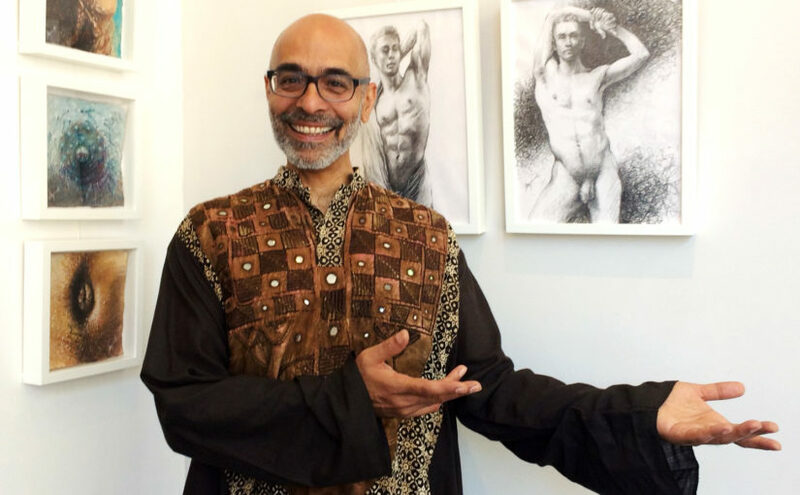 I felt embraced by all the diverse artists of Male (IEU) engaged in exploring the body. Drawing from life as a means to cultivate critical scrutiny the group uses peer critique to further develop their understanding and practice. Now Male IEU works off/from/with the human body in the present and engages with such current discourses. Working on a weekly basis, different artists thematically frame each session with a renewed interrogation of the body. As if my acceptance within the collective was not enough, I was invited to show in their inaugural exhibition That Shadow of a Shadow. Having managed to throw a bone to my self-critic, I felt free of the burden to perform. To be with the group week after week, allowed me to tap back into my truth. I am playing, experimenting, and proffering to the constructive criticism that allows deep pleasure of drawing the human form to resurface. In the past what would have given me endless anxiety and butterflies, made the preparation of seven new drawings a JOY! Suddenly the penny has dropped, a big step of un/learning is taking place. I am listening to my inner voice. The key is to distinguish that which is yours and that which is an accumulated voice of what people say but pretends to be yours. Throw a bone for your self-critic and throw that bone far away!